The author’s Canadian-born curly horse, Lucky Jack. Scientists are penetrating the complicated world of curly horse genetics, with each piece of the puzzle solving another part of the mystery. Dr. Mitch Wilkinson, in the final report in his three-part series, explains how science is leading the way. Wilkinson, a lifelong horse enthusiast with a post-doctoral master’s degree in biology, as well as dental and chemistry degrees, chairs the Curly Mustang Association and is vice-chairman of the Research Department of the International Curly Horse Organization (ICHO). The series is published courtesy of the ICHO Gazette. Because it was not known until very recently that curly coats in horses were caused by multiple, independently inherited genes, curly horses having different gene mutations were mixed in breeding programs which resulted in individual horses that carry multiple mutations. The first known horse found have two independent curly genes was a stallion named Chester. Chester is owned by Angie Gaines in Kaufman, Texas. This horse tested heterozygous (one copy of a gene) for the KRT25 mutation. Chester had been bred to a mare that did not have curly traits. The resulting foal, named Bucky, had a curly coat, but tested negative for the KRT25 mutation. The stallion Chester is heterozygous for the KRT25 gene, as well as the Curly Jim mutation. He is owned by Angie Gaines. In checking the background of the sire, Chester, it was found that his bloodlines included the Curly Jim line of curly coated horses. Because the colt sired by Chester did not carry the KRT25 mutation, his curly coat must have been due to the Curly Jim mutation which was also carried by the sire. Although the Curly Jim mutation has not been isolated at this time, the conclusion is that Chester is carrying two independent mutations for curly coat, KRT25 mutation and the Curly Jim mutation. Blossom is a non- curly coated mare who was bred to Chester. Bucky is a colt from Chester and Blossom. He is suspected of carrying the Curly Jim mutation. He is owned by Angie Gaines. As additional curly producing genes are isolated, horses like Chester and Bucky can be tested to definitively confirm their genetics. 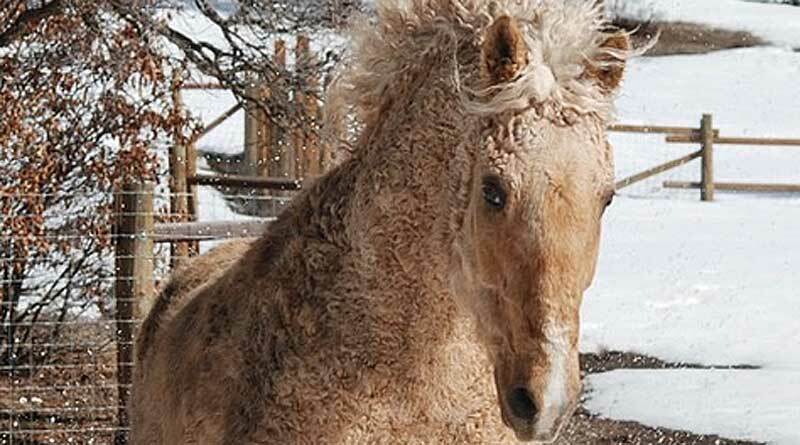 It has been speculated that since the mixing of different curly producing genes goes back to early curly breeding programs, many curly coated horses may be carrying more than one curly mutation. The combination of curly gene mutations in individual horses leads to a dazzling number of possibilities of curly traits or phenotypes. In 2012, the International Curly Horse Organization teamed with Texas A&M University and Uppsala University in Sweden in a study of gait in horses. The cat ate the rat. If we substitute the letter “k” for the “c” in cat. The sentence would still make sense. There would just be an alternate spelling of the word “cat”. In the language of DNA, there are alternate spellings for specific proteins. TAT and TAC both code for the amino acid tyrosine. The kat ate the rat. When another letter is changed in the sentence, for instance, the change of the letter “r” in rat to a “b”. The entire meaning of the sentence changes. Instead of the cat eating a small rodent with a tail, the cat is eating a bat, a winged mammal. The cat ate the bat. What was just shown is a missense mutation. This is the type of mutation that happens in the KRT25 gene to create a structural change in the protein which this gene produced. The changed protein eventually led to a curly coat. The cat atm the rat. The three letters, “atm”, are not a recognizable word. This is a nonsense mutation. The messenger RNA treats a nonsense mutation as a stop codon and quits reading the sequence at that point. In the case of the DMRT3 gene, 174 amino acids were left off the protein that was produced by genes affected by the nonsense point mutation. In the short hand notation used by geneticists for alleles (two versions of the same gene), the symbol, “CC”, is used to denote a “wild type” or normal 23rd chromosome pair in which both chromosomes have cytosine in the associated area of the DMRT3 gene. The symbol, “CA”, is used where one chromosome of the 23rd pair has the nonsense mutation where an adenine was substituted for a cytosine. Finally, the symbol, “AA”, is used to donate a 23rd chromosome pair in which both chromosomes are affected by the nonsense mutation which produces gait. This brings us to another topic which has been a point of much discussion. Where did the KRT25 missense mutation originate? As we can see from the gait-keeper mutation, horses have been exported and traded from ancient times. But the absence of the KRT25 mutation in known curly coated horse populations found in other locations around the world, leads one to suspect that this mutation was not imported from another location. We may never know for sure, but there is a strong possibility that the mutation happened with a single horse in the American southwest sometime after the Spanish re-introduction of the horse between the late 1500s and mid 1800s. Like all mutations, those that are favorable for animals in a particular environment tend to increase in the population, especially those with a dominant mode of transmission. This is classic Darwinian theory. If the KRT25 mutation can someday be proven to arise from feral (wild) horse populations in the Southwestern United States, it would make these horses uniquely American. We now know that the North American curly population has curly coats due to several different gene mutations. Some may have originated in North America while others may have been imported from other horse populations. Only by isolating more genes which cause curly coats in equines can curly horse origins be determined, for historical records are lacking or non-existent. The Lp gene has been a part of the curly population since the earliest days of domestic breeding. It is not known what percentage of the American curly horse population carry the LP gene, but it is a high percentage. In the past 30 years, there has been an explosion of equine genetic research which has led to numerous findings. The cost of genetic testing has continued to decline bringing us to the point of tests that can be done at a very reasonable cost. Throughout the ages when scientific knowledge was not available to horse breeders, the breeders turned to “lines” of horses to help predict breeding outcomes. The dawn of the 21st century has brought scientific advances that will displace the traditional methods of breeding horses and defining “a breed”. For the first time, genetic tests at reasonable costs can tell what gene combinations breeding stock carry in their genomes and what genes particular horses carry as individuals. The International Curly Horse Organization (ICHO) has been at the forefront of sponsoring research related to curly coated horses around the world. This organization and the dedicated individuals that make up its membership and staff have put scientific facts first. The extensive genetic data base kept by the registry will be a resource for future generations of horse lovers and breeders. ICHO has taken the lead in being one of the first truly modern, scientifically based horse registries. Four traits, including DMRT3 for gait. Tests are also available for KRT25 and Ancestry Associations through ICHO. As of the writing of this paper, 174 Ancestry Association tests of both wild and domestic curly horses have been cataloged in the ICHO data base. Every horse that is tested adds to the common knowledge. Some of the gene mutations that are thought to be different in various lines of curly coated horses may turn out to be the same mutation after the different causative genes are isolated. It is equally probable that the existence of new curly causing genes may be deduced from the results. As the complicated world of curly horse genetics progresses, each piece of the puzzle seems to solve another part of the mystery, while at the same time, opening the door to new questions and lines of inquiry. The genetic results outlined in this article would not have been possible without the continued research and support of Dr. Gus Cothran and his staff and students at Texas A&M University. Dr. Cothran has diligently worked to solve the mystery of curly horse genetics for over a decade. His scholarly advice and guidance about the contents of this manuscript was invaluable. Bunny Reveglia, the office manager of the International Curly Horse Organization, has systematically documented genetic data, pedigrees, coat types, and generally coordinated the research into curly coats in horses. Without her dedication, the genetic research into curly coated horses would not have taken place. The continued support of ICHO board members and their dedication to science has allowed this valuable research to continue. They all deserve some special thanks. Finally, individual horse owners that have given their support to these projects and most importantly given homes to rare and unique curly coated horses need our thanks. Most notably Angie Gaines of Golden Curls Ranch who has tirelessly given a home to many of our most rare and valuable horses. Duv Cardenas and Krista Harvey who both adopted two of the most endangered types of curly horses and gave them both wonderful homes. Finally, George Kurek and Vicky Ives who helped to track down curly coated horses in the Spanish Mustang Registry. Although there is still much work to do, without the help of all the dedicated horse owners above, the mysteries of curly coated horses would forever be in shadow. Pruvost, Melanie; Bellone, Rebecca; et al. Genotypes of Pre-Domestic Horses Match Phenotypes Painted in Paleolithic works of Cave Art. Proc. National Acad. Of Science, 2011, 108(46): 18628- 18630. Andersson, Leif; Cothran, Gus; et al. Mutations in DMRT3 affect Locomotion in Horses and Spinal Circuit Function in Mice. 2012, Nature. 488: 642-6. Promerova, M. et al. Worldwide Frequency Distribution of the “Gait – Keeper” Mutation in the DMRT3 Gene. 2014, Animal Genetics 45:274-82. Reveglia, Earlene. Genetic Data Base: International Curly Horse Organization, 2017. Pierce, Benjamin. Genetics: A Conceptual Approach, 5th addition. Macmillan Pub., 2013.